The social bonds of rattlesnakes are cloaked in mystery. Most snakes live as solitary animals, and many rattlesnakes follow that same course. However, rattlesnakes often share resting spaces with others of the same species, especially their young. They typically hunt alone, so if you see a rattlesnake in your yard, there's not much concern of more following behind. Rattlesnakes use dens, such as the hollows of trees or burrows left behind by rodents and other mammals, to rest and keep warm in the winter. They leave these dens to hunt for food. Rattlesnakes are solo hunters, searching for food only for themselves; they don't travel in groups or hunt in pairs. During mating season, it's possible to catch a glimpse of a male and female rattlesnake together. They don't always mate immediately upon finding each other, so it might appear as if they're traveling together. The male tries to gain interest from the female by rubbing his head on her or coiling his body around hers. When the female either accepts the male and mates or declines his invitation, the two part ways. You might also see two male rattlesnakes together around mating time. They often lift their upper bodies off the ground and dance in a show of strength, trying to intimidate the other male and gain favor with any nearby females. When the dance is done, however, the males don't spend time together. Rattlesnakes often return to the same dens; some come back every year, while others stay only until food sources start to slack off before looking for a new den in a different area. More than one snake might use the same den; they might not coil up together to sleep, but just share the space. They come and go at different times, however; they're not sharing their lives, typically, but are simply sharing housing. 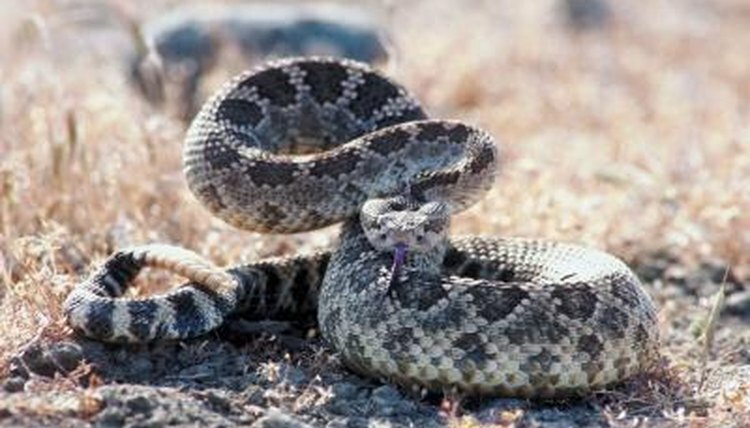 Shared dens are more common among rattlesnakes that are related to each other, according to National Geographic. Some females might congregate together in safe den areas while gestating as well. As cold-blooded animals, snakes are susceptible to the harsh winter temperatures. They retreat into their dens for the duration of the cold season. Adults are typically on their own, but rattlesnakes lay pheromone trails that help their young find the den. They share the den with the young for the winter, and some of the offspring might adopt the den as their own year after year. Boyce Thompson Arboretum: Visitors Observe Demonstration Garden Rattlesnake "Dance"